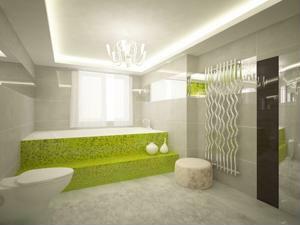 Picking out your favorite color and running with it is one of the best ways to approach your bathroom remodeling project, and there are few colors that are more versatile than green. The hue can combine beautifully with a full range of bathroom accessories and other modern appliances whether you're going with a specific theme or design style. While you may have the perfect color choice in mind, where do you start? Use the following ideas from Better Homes and Gardens to create a dynamic new space in your home. 1. Stripes. A striped color scheme is a fabulous way to work with the dimensions of your washroom and add compelling contrast that can open up your style choices. Consider using varying shades of green on your walls, such as a base hue and a pastel shade. This will allow you to incorporate all sorts of green linens, furnishings and other accessories that will adhere to your theme. However, the news source suggests that you should include a few neutral accents, such as black picture frames and towel rings, to give the space a bit of contrast. 2. Green and blue. If turquoise is more your speed in a washroom, consider using mosaic tile as a backsplash for the wall behind your bathroom vanity. This color combination pairs surprisingly well with hardwood cabinets and sleek chrome faucets and dials, as well as other contemporary features. Once again, contrast is key when working with such strong colors, so use small countertop centerpieces, linens, window treatments and shower curtains to introduce neutral hues and complementary colors into the washroom to give it a bit of variety. 3. Pastels. If you're a fan of white wainscoting framing the lower half of your bathroom, opting for pastel green is a chic pairing that you will love for years to come. This is also a great choice for those who adore the cottage style and will have a great influx of light in the room. Polished nickel fixtures and white storage cabinets can help to a bit of classic style into your room that can be finished with colorful area rugs, wall sconces and storage baskets. As you embark on your bathroom remodeling project, having a distinct color in mind can certainly help narrow down your style choices and help you craft a lasting interior design. What tips do you have for those decorating an all-green bathroom?